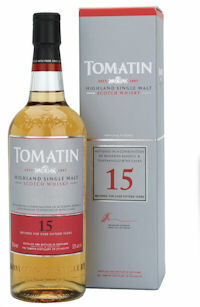 Tomatin Distillery has announced the launch of a limited edition brand extension to the Tomatin Highland Single Malt Scotch Whisky range. The new release is an exceptionally high quality spirit which has been matured for over 15 years in a combination of Bourbon barrels and Tempranillo wine casks. It was agreed that 52% was the optimum strength for achieving the perfect balance between flavour, body and overall mouth feel. The result is a whisky which is dominated by deep fruity aromas softened by a sweet candy flavour with a long lasting and very creamy finish. Graham Eunson, Distillery Manager, explains how this new edition came to be: “I’ve always found the interaction between the casks and the whisky fascinating and this expression of Tomatin is no exception. The intensity of the wine casks is gently softened by the use of second fill ex-bourbons to achieve a perfect balance. The combination of flavours and aromas achieved by the use of these differing casks is fantastic. This product is available now and support communications including a film with Graham Eunson will be available via Tomatin’s social media channels; Facebook, Twitter & YouTube. Aroma: Deep fruity aromas are dominant with plums, blackberries and fresh grapefruit taking centre stage. Softens with hints of vanilla, tobacco leaves, beeswax and sugar candy. Palate: The sweet candy flavour plays a major role in the overall structure of this single malt. Like the nose the palate is rewarded with some big fruity flavours – bananas, crunchy green apples and poached pears – which are nicely balanced with the drying tannins and white pepper.